Say hello to Samsung's new Windows 8-powered PCs. The South Korean company shared its plans for a whole line of Smart PCs, tablets and smartphones running the new OS at IFA Wednesday, and first off the docket are a pair of new PCs. 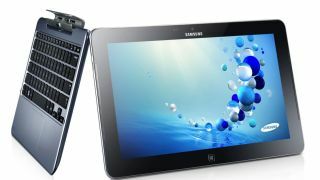 Named "Ativ," Samsung introduced its new brand and new keyboard-optional slates at the Berlin conference. A play on "vita" - Latin for "life" - Samsung said it's aiming to make everyone's life a little easier with its new consumer-friendly Windows 8-powered devices. From Samsung's perspective, the marriage of its design and technology with Microsoft's operating system is a match made in heaven. First up for Samsung are its notebook/tablet hybrids, the Smart PC and Smart PC Pro. Slated at 11.6-inches, the devices have Windows 8 functionality with full Windows 7 compatibility. The Ativ Smart measures 9.9mm while the Pro is a slightly bulkier (though that's not saying much) 11.9mm. Each device features a detachable keyboard/docking system designed for a quick switch from clamshell notebook PC to tablet. The touchable tablets also sport a 10-finger multi-touch screen, meaning users can get their other eight digits in on the action. Adding another mode of manipulation, the Smart PC and Smart PC Pro each come with a S-Pen, making things like handwriting and drawing (and doodling) a viable option. They even come with a preloaded S Note feature, which Samsung says makes the whole S-Pen process a breeze. S Camera accompanies a fully integrated front and rear camera, while users can watch seamless playback of the pics and vids they shoot thanks to S Player. Those images should pop thanks to the PCs' SuperBright Full HD LCD display. The Smart PC Pro runs on an Intel Core i5 processor while the Smart PC has a next-gen Intel Atom processor. The Pro features two USB 3.0 ports while its counter part has a USB 2.0. Both come with mHDMI, miniSD and two extra USB 2.8 ports on the keyboard. With 13.5 hours of battery life, the Smart PC outdoes the Pro by a few hours - the stronger of the two only runs for eight hours. TechRadar will have more Samsung news as it unfolds.